Every year, thousands of people are killed or injured in car wrecks caused by aggressive driving. As you all may know, this type of driving is known as road rage. Despite this atrocity, many people still are impatient on the road and tend to neglect the idea of safe driving. For this reason, we thought you might be interested in reading about it. There are many ways to go about dealing with frustration on the road. Listed below are a few tips to help your driving experience go smoother. Sleeping is a contributing factor to road rage. Without getting the accurate amount of sleep the night before, it can make us cranky. Road rage makes us prone to feelings of annoyance, resentment and even anger. Getting at least eight hours of rest each night is the recommended daily dose of sleep for adults. How are you in the morning as you’re preparing to leave? Do you regularly rush through your morning routine, trying to make up time while on the road? Or do allow just enough time to drive to your appointment? Either way, you are prone to a loss of temper. By simply adding 10 minutes to your expected travel time will leave you with enough time to stop for gas, pick up some breakfast and beat the traffic that lies ahead. 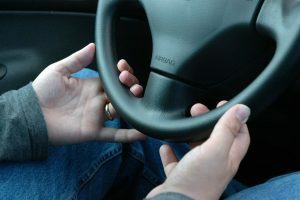 Are you the type to clench the steering wheel as you’re driving? Try flexing your fingers to loosen your hold. Loosening up will not only help with your road rage, but it will also keep you in control of your vehicle. Stretch as much as you feel the need to do so, this helps you avoid being too cramped up. Experiencing car trouble from road rage?